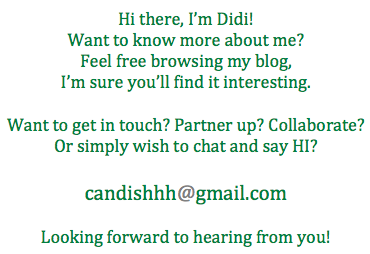 I have to be honest. This restaurant is one of those that I usually pass on. Maybe because the company I am with are not typically ones who enjoy the Spanish cuisine that Alqueria offers. I personally love paella, but I can't finish one whole order - well, I can but it's quite embarrassing to finish one just by myself. Hahaha!! So when I got invited by Yen of The Tummy Traveler, I was delighted. I said to myself - Finally! I will get the chance to try their food! I was very excited. So that night, I braved the traffic and I think the traffic gods were cooperative because for the first time EVER - it took only 30 minutes from my house to get to Megamall. It was a miracle. It must be meant to be. I know. I think? Hahaha..
That same day in Megamall, was the premier of The Love Affair. Yaya Belen and I were wondering why there were so many people waiting near the escalators - apparently, the stars would be going up that direction. Hmmm, it's been ages since I've witnessed a movie premier. There I met Yen and Chuckie - I even kidded with Chuckie that he was the *star* that the crowd was waiting. I just need to share that I used to be a fan of the Isabel Granada-Chuckie Dreyfus love team back then. Hahaha! Then one time while I was channel surfing, I stopped on Cinema One - because it was showing the movie Tiyanak. Chuckie was there and I found it hilarious that a teener (back then) was holding a gun and was, you know freely holding it and totting it. It was such a hilarious scene now that I'm an adult. Hahaha! It was just unforgettable. I joined the table where Jackie, Gabbie (Jackie's little girl) and Marge was seated. It was also so nice that I finally met Jaz (and husband Eric) in person, we've been IG friends for a while and she seems really really jolly - my kind of a happy person. Hihi. Abet was there too! When we were all settled in, dinner was served. 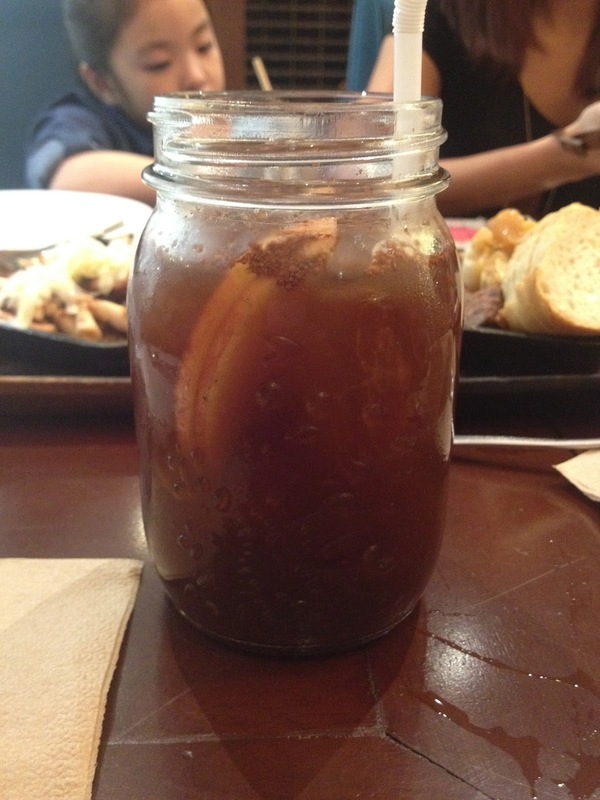 Since I love Cinnamon, it was a no brainer for me in picking this drink a Cinnamon Iced Tea! I was very excited to taste it when it arrived and it was love at first sip! I had to control myself from finishing this drink before the rest of the dishes arrived! Yes, it was that good! I wish I can take home a pitcher of this wonderfully refreshing drink! Who doesn't appreciate a good plate of salpicao? I remember when I was young, I would order this and just this (and garlic rice) whenever in a Spanish restaurant. Alqueria's Salpicao is made of cubes of sauteed imported tenderloin and is marinated with garlic, spanish paprika (I didn't know this!) and olive oil. This is my go to dish to serve to the kids too. Who would have thought that octopus can be eaten? I've honestly just seen these little squirmy creatures being served in Korea and I was squeamish on that! 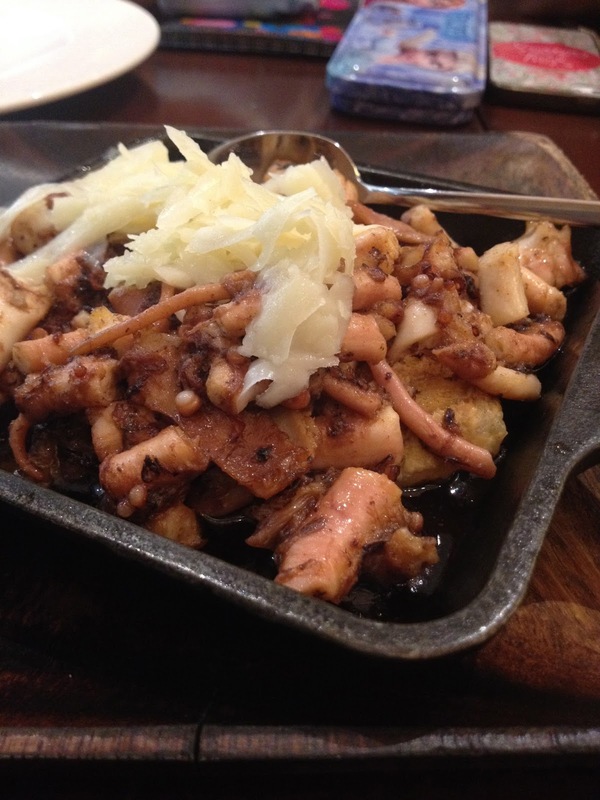 But this time, Alqueria served them cooked AND with potatoes and Manchego cheese! This was the surprise of the night for me. I never thought I'd like it, but I do! A few days after this dinner, I told my MIL (Mother In Law) to buy this dish to bring home because it was really good, and it was such a hit for her and for my FIL (Father In Law) It was tender, it was flavorful and it was something different! 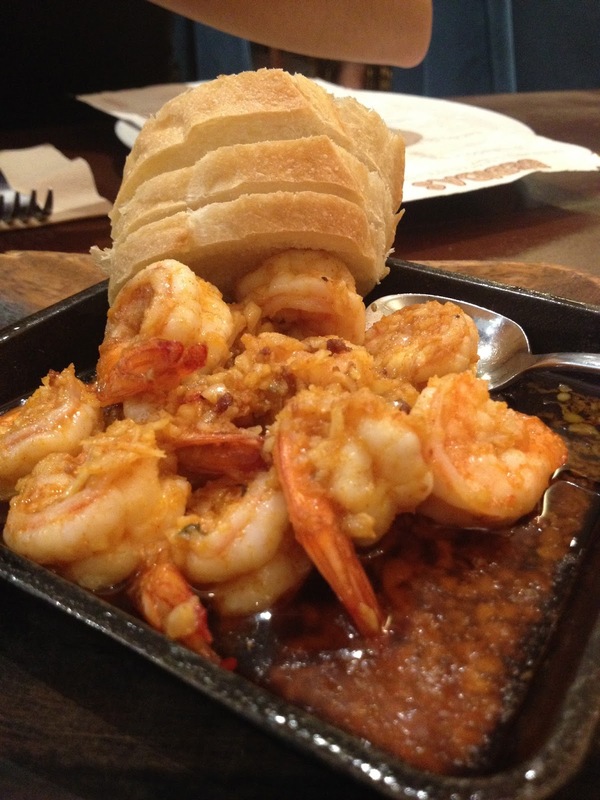 Gambas is also one of those staples that you order in the Tapas menu. I liked how they butterflied the shrimps and served it with its tail intact. Most restaurants don't even bother to butterfly and just serve them without presentation. Alqueria's gambas is beautiful to look at and tasted wonderful too! I especially loved the sauce - I think I scooped most of the sauce on my place and ate with it bread! You know, the saw saw kind - hahaha! Now, for the main course. Are you as exited as me? I have to be honest, I don't fancy lamb or goat (I still can't help but think they're very gentle animals) But my tablemates all sampled this and they gave it a thumbs up. I heard oohs and aahs that the meat was very tender and the taste wasn't *malansa*, and that the sauce was wonderful (bring in the rice please!!). I'm guessing that had I brought my Panget with me, he would have loved this caldereta! Do you see what I see? 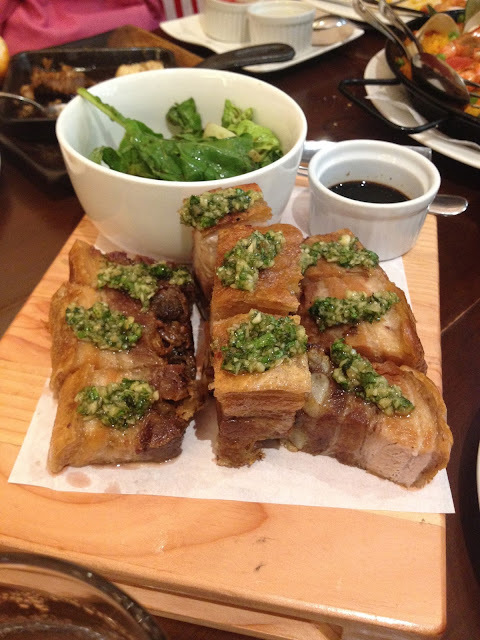 The perfect pork belly portion? The meat and fat layers alternating? THIS is what I look for in EVERY pork belly - the wonderful layering of fat and meat. For me, it makes ALL the difference. 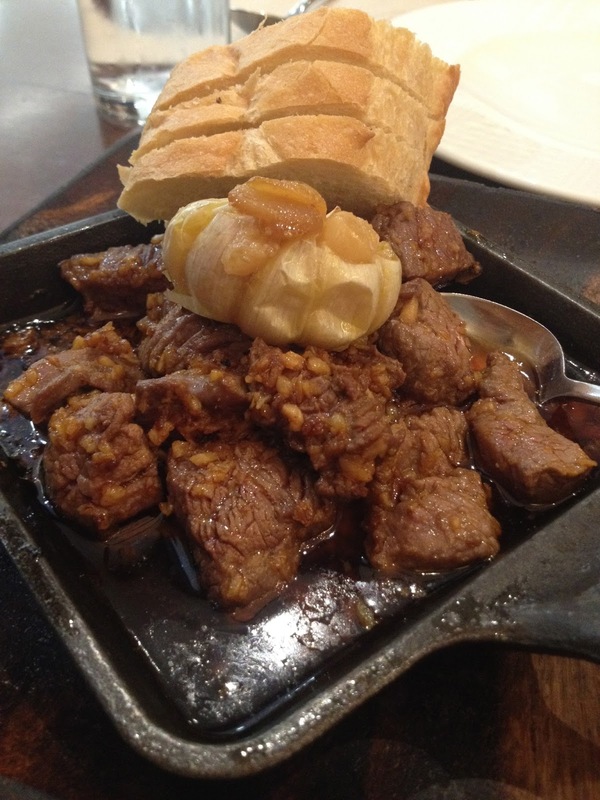 This dish was a standout for me because the meat was very tender and juicy PLUS the skin is very crispy! I also loved the gremolata which I think is the spanish version of the chimichurri sauce! It worked well together. 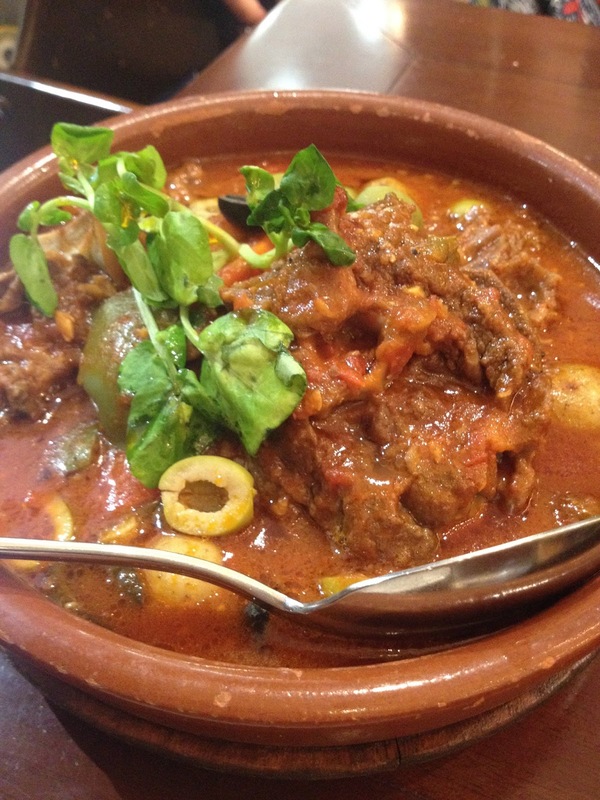 I can't stop raving about this dish! It was really really very good, that even Connor liked it and asked for more! Who doesn't like steak? EVERYONE loves a good piece of steak. We are after all meat eaters! This piece of steak was good and cooked to perfection. I'm sure my Panget would love this AND he would eat it all by himself! Waaah! The portion is good enough for the price. I would most definitely order this again next time. 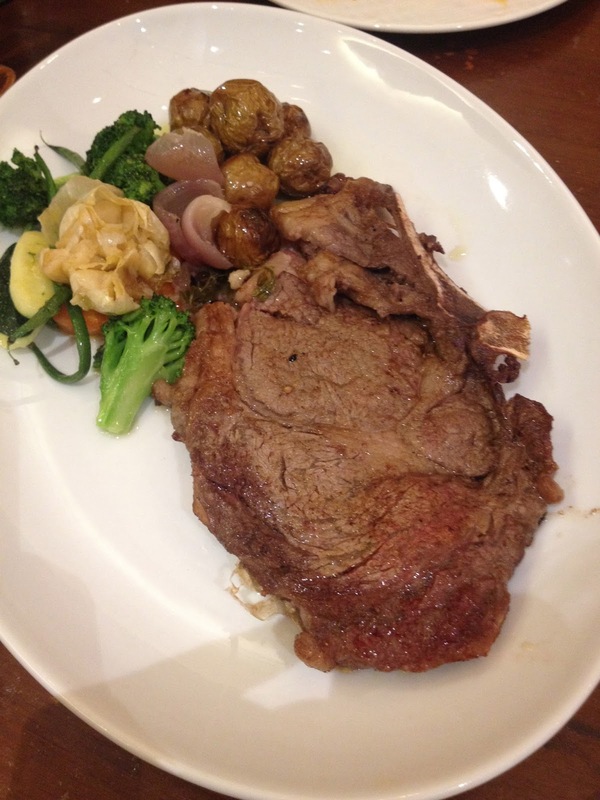 I forgot to mention that you can have this steak cooked to your preference - rare, medium rare or medium. I personally prefer well done, but hey - that's me! I've seen so many episodes of Master Chef and I've learned that steak should be cooke medium rare. Hihi.. 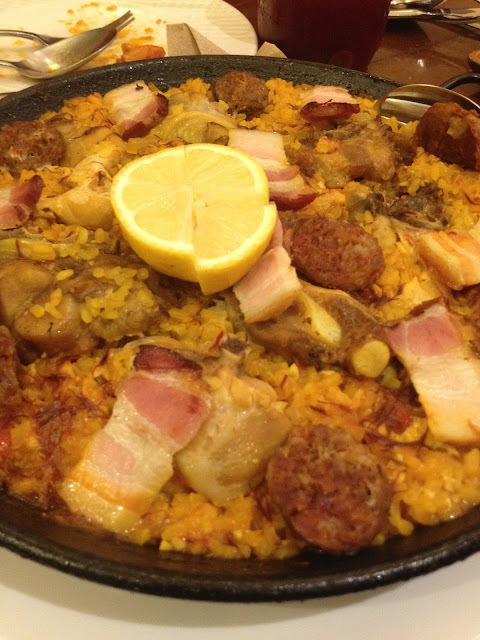 Here comes my FAVORITE Spanish dish - the Paella! Do you know that it's pronounced as Pa-Eya? Yes, I learned this while watching the Food Network, but hey - we're in the Philippines and I think pronunciation doesn't matter much - as long as it's the same dish we're talking about. Hahaha! I love that it comes in a variety of sizes. Most restaurants will just serve it in a single size! Anyway, who doesn't love a symphony of meats in their paellas? There's chorizo, chicken, smoked bacon and pork spareribs! It's an all meat paella. I loved to combination of the tastes and the toppings! I've long put in my head that paellas are *the* complete dish - why? Well, there's rice and meat toppings! No need to order separate dishes! That's they way I think, and I think that's why I love Paellas so much. Hahaha! It's all there! 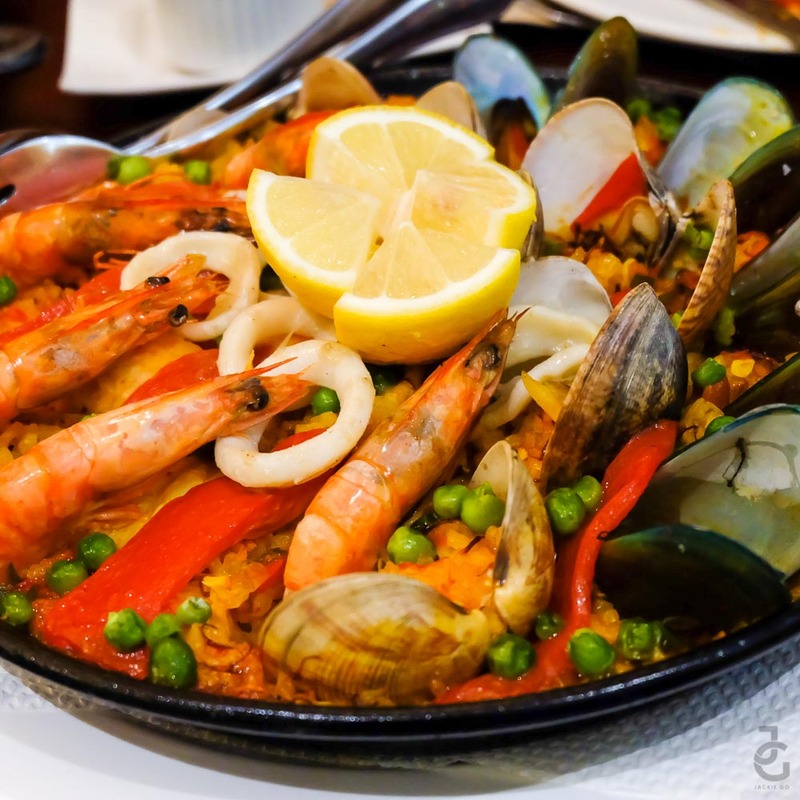 I am partial to seafood and that's why my favorite of all Paellas is the Paella Valencia. I didn't get to take a picture of the gorgeous and yummy paella so I just grabbed this beautiful picture from Jackie of GoJackieGo, of course with permission - see the watermark? Yes! Thanks Jackie! Look at that beauty, look at the generous portions of seafood! This picture will make you hungry and let me tell, you - it's worth ordering and all the calories that comes with it. Hahaha! It's satisfying and delicious. 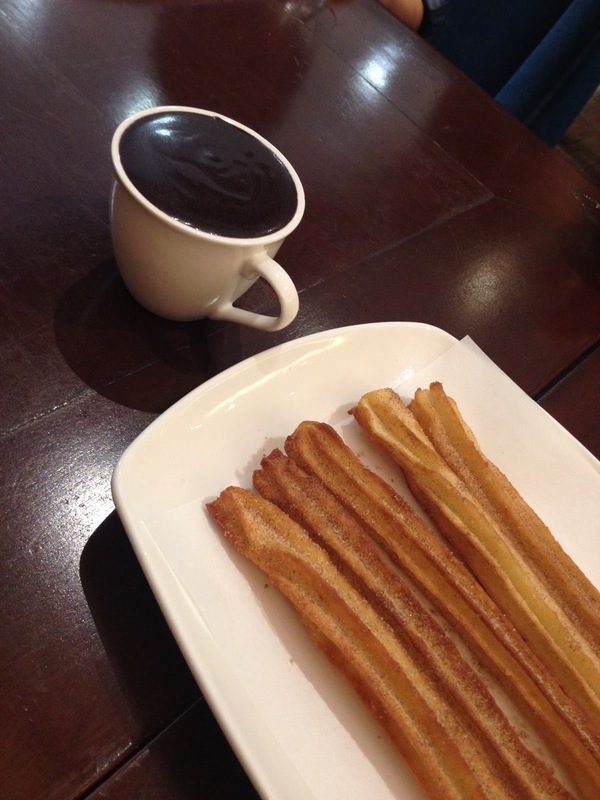 Last but not the least - Churros. Who doesn't like them? Dip them in chocolate or eat them alone - they're wonderful! I remember a scene from the TV show Arrow - when Nyssa was telling Laurel Lance how she find it odd that in America, people fried all of their food and Laurel replied with *Everything tastes better fried* I so agree! Hahahaha!! Thank you Yen and Chuckie for sharing with me Alqueria's delicious dishes! I still can't believe I ate an octopus! Hahaha.. Thank you! I really enjoyed dinner, as I said - good food + wonderful company of friends - that will always be a perfect combination. Next time ulit! So, if you happen to be in Mega Fashion Hall - head on straight to the 3rd floor and on to Alqueria - I promise you, you won't regret it. The food is good, price point is reasonable, the ambiance is nice - and you will be filled full! Staff is friendly and attentive too. What more can you ask for? !